The idea of a pleasant drive through the countryside or a quick pop into town that our parents or grandparents might have enjoyed, is not the experience of many of today’s drivers. In fact, according to new research from Direct Line Car Insurance, a third of UK drivers’ time spent on the road is said to be unenjoyable. The top reason given is having to face aggressive drivers, followed by being stuck in traffic jams, with road rage taking third place. 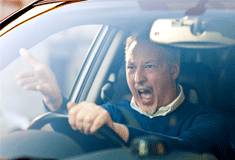 The research found that people enjoy the psychological aspects of driving far less than the practical side, with seven per cent claiming they avoid driving because they just don’t enjoy it. Other aspects of driving that takes the joy away were getting stuck behind slow moving vehicles, driving during rush hour, driving in bad traffic, driving in difficult weather conditions, dealing with other drivers, finding a parking space and driving in busy town centers. But not all hope is lost. Nick Reid, head of automotive technology at Direct Line Car Insurance commented: “Those who pine for a golden age of motoring may enjoy a revolution on our roads in years to come. Technology is already playing an increasing role in undertaking tasks traditionally carried out by the driver but this is set to peak if driverless cars make it onto our roads. To help drivers get back to enjoying driving again, in-car technologies are becoming ever more popular, with things such as parking assist, rear view cameras and cruise control. On average, people in the UK spend two hours and 17 minutes a week driving - equating to roughly 20 minutes per day. The research supported the idea of having more in-car technologies, with 13 per cent of drivers saying they would enjoy their driving better if their cars had the technology to assist with the more onerous aspects of driving.